Netherlands midfielder Kevin Strootman will miss the World Cup after tearing a cruciate ligament in his left knee while playing for club side Roma. 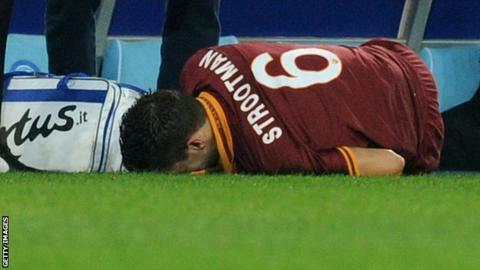 Strootman, 24, was substituted after he was injured during the Italian team's defeat at Napoli. "I can imagine how disappointed he must be," said Dutch coach Louis Van Gaal. "For the national side it is a huge blow. Kevin made a huge contribution to our qualification, he never let us down and now his dreams have died." Kevin Strootman completed 514 passes for the Netherlands in the World Cup Qualifiers - more than any other player. Strootman, who joined the Serie A side in a €18m (£15m) transfer from PSV Eindhoven last summer, tried to continue after going down in the early stages of Sunday's loss against Rafael Benitez's side. But he eventually had to be replaced and a scan on Monday revealed the extent of the damage. Roma have not indicated how long he will be sidelined. "Tests showed he has torn the anterior cruciate ligament in his left knee and there could also be damage to the meniscus," said a Roma statement. "He will undergo surgery in the next few days." Ex-Barcelona and Ajax coach Van Gaal had previously said Strootman, captain Robin van Persie and winger Arjen Robben were three players guaranteed a place in his World Cup squad. The Dutch have been drawn alongside champions Spain, who beat them in the 2010 World Cup final, Australia and Chile in Group B.